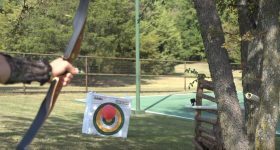 Hollywood Archery- Is it even possible? This guy proves it is! This Danish shooter would make Legolas enroll in his training program, Robin Hood stalking him for autographs, and Katniss become a cheerleader. He just proves what practice can do.